They got their European breakthrough in Germany when they finished 5th at the 2010 Eurovision Song Contest and now A Friend In London’s Tim Schou and Sebastian Winther Olsen will come back for an intimate concert in support of charity. The concert takes place in Landau on the 1st of December. 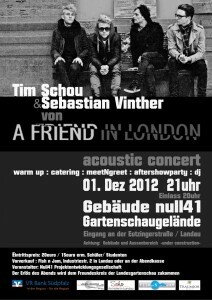 A few days ago fans in London could experience a small intimate concert by A Friend In London‘s Tim Schou and Sebastian Winther Olsen. The concert was arranged by a fan, something that is also the case for the gig in Landau, Germany on Saturday. The performance will start at 9pm with a meetNgreet afterwards where a DJ will also entertain the audience. Only 200 tickets will be sold for the event that takes place at a old French military area, which is now being renovated for the exhibition Landesgartenschau 2014, in the building called Null41. Once finished it will host restaurant, venue and a wine tribute as it is located in one of the large win production regions in Germany. Several social events will be arranged as well – and the income from this concert will go towards such charity events. To read more about the event and contact the organiser Uli Zarges you can go to the Facebook event for the concert, that gives a good opportunity to hear more from the album that will be released in January. Tickets for the concert are priced at 20 euros with a student discount at 5 euros. Below you can see A Friend In London’s performance of New Tomorrow in relation to the 2011 Eurovision Song Contest where they finished 5th.